This online version is super and updated monthly! Absolutely the best guide for the LGBT community in Rio! These guides are SO extensive and we have been using them for years! Your guide to what’s happening in the most exciting cities on the planet. ***SIKE!!! While TimeOut Guides are our favorite, they have yet to publish one for Rio de Janeiro! Has taken over the Internet! Great source for reviews on hotels, restaurants & just about anything “Rio”. More insight into the Cidade Maravilosa! Lots of helpful information for the samba lover! Hands down the best website with up to date and correct information on Carnival venues, times, traditions, etc. Fun, fresh commentary on Rio happenings. 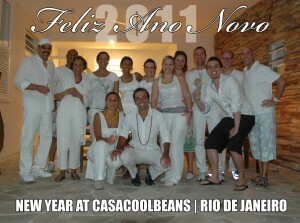 Another GREAT blog on life in Rio. No we didn’t forget Fodor’s! Below is a photo of our wonderful guests on New Years Eve prior to heading to Reveillon celebration on Copacabana beach…it was a blast! We hope you can join us next year!! !